There are several Christian churches of various denominations (Catholic, Orthodox, Armenian, Maronite etc.) in Beirut. 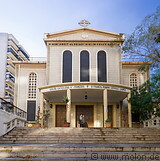 St Francis is a catholic church in Hamra street with services in French, Arabic and English. The Saint George Greek Orthodox cathedral on Nejmeh square is the seat the Greek Orthodox Metropolitan bishop of Beirut. It dates back to the 5th century but was destroyed and rebuilt several times over the centuries. The St George Maronite cathedral is the seat of the Beirut archeparch. Located on El Amir Bachir street it was completed in 1894. The cathedral of St Elias and St Gregory the Illuminator is an Armenian Catholic church in Debbas square. It was built in 1928.